Hi I'm trying to implement a GDPR compliant tracking. When the consent has already been given I check that in the mounted hook and run enable again. However, it seems that window['ga-disable-UA-XXXXXXXXX-X'] is set to false but google analytics is loaded shortly after, setting it to true again. According to the official article on GDPR it should be the way to implement or am I wrong? I've tried to only run enable when ga is loaded, but the official implementation does not work for the nuxt module. Calling this.$ga.set() in created causes an undefined error. Just thought that it would be a good idea to have this in main analytics module of nuxt. E-Commerce tracking not registering in GA Dashboard. I am having an issue getting e-commerce tracking data to actually register and display on the GA dashboard. I am running a laravel/vue/nuxt app in a vagrant virtual machine on my local computer. Regular analytics data, such as page views, etc is registering and displaying in the GA dashboard just fine, as are "real time" metrics, so I know that my localhost environment is successfully communicating to googles servers and there's no network connectivity issues. The GA e-commerce script is successfully loading into the site, and events seem to fire off correctly, and I'm not seeing any issues when I use the official GA Debugger browser extension for chrome. Initially, I thought perhaps that it was the google analytics delay time that might have been preventing any data from registering in the dashboard immediately, so I waited a day or so, but I'm still getting this screen when I view the e-commerce dashboard in analytics. This is the code in my vue template which is calling the GA e-commerce functions. Everything seems to be working fine, but for some reason I am still getting the "This report requires e-commerce tracking to be set up for this view" issue in the GA dashboard, so I'm not able to see any actual data showing up in the dashboard. This is my first time using vue/nuxt/analytics-module, so I think there might be a slight mishap on my end. Any help/insight would be greatly appreciated. I'm trying to figure out what the issue could be here. I followed the very simple setup instructions as outlined on this repo (npm i --save @nuxtjs/google-analytics), and adding it to the nuxt.config.js modules array. When I run npm run build and npm run start locally, the analytics "real time" shows my footprint on the site. When I pushed the code to the production server, ensured npm installed the dependency, reran npm run build / start -- nothing. No errors (even when ran in dev mode), and it's not showing my real time footprint in GA. In GA for the property settings, I have it set to use the correct URL https://mysite.com.. I have a server that is used for different domains. I want to for each domain it uses a different ga id. How do I preemptively disable the tracking code, e.g. based on opt-out cookie? I tried calling this.$ga.disable() at many different points in my nuxtjs application, but I always send out a page tracking event — I can see it in the GA real-time view. Obviously you can't have this in a middleware, as this.$ga is not available server-side. So, how am I supposed to do this? Is there any technical reason to not update to vue-analytics v5.16.0? I can not install the analytics-module. 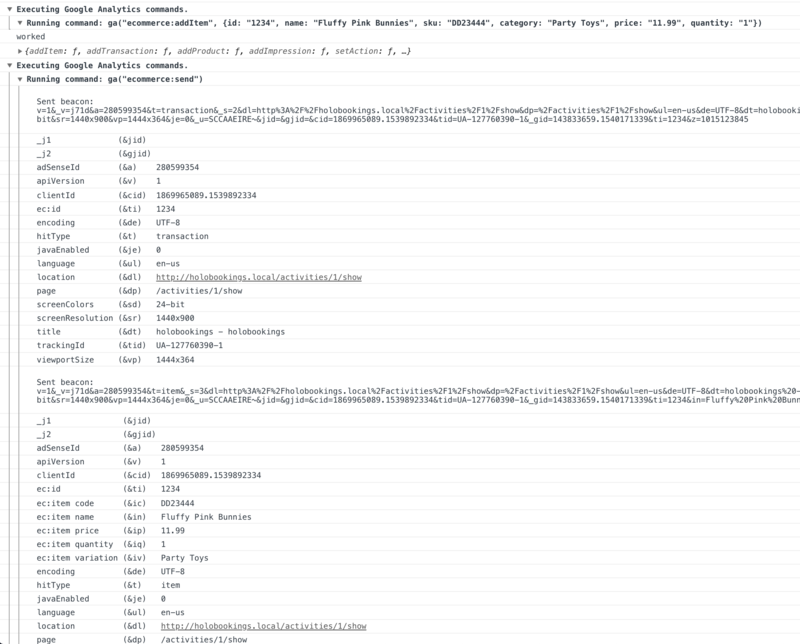 I do not see the analytics code in the source code. Error with Route Name in ScreenView. Uncaught (in promise) Error: [vue-analytics] Route name is mandatory when using screenview. To have a realistic bounce rate. I get a 10% bounce rate which is super low. I'm thinking something is broken with the module. idea Urgent: Please publish master to npm so we can opt out for GDPR compliance! It does not work inside a mixin. So I moved it into a Vue file directly and it worked.